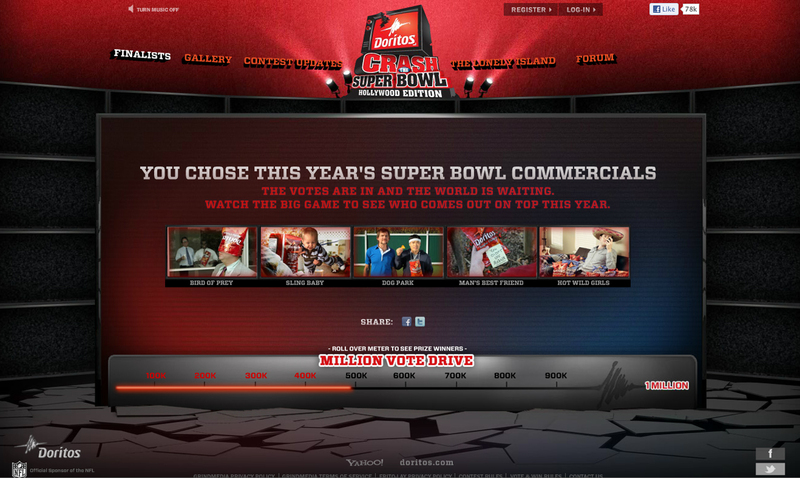 Doritos is running “Crash the Super Bowl” for the sixth year in a row, soliciting consumer-created commercials, calling for public votes at crashthesuperbowl.com. Five finalist videos were chosen from 6,100 entries to compete for a chance to win a $1 million cash prize, if the ad scores the number one spot on the USA Today Ad Meter. The maker of the ad voted by the public to air during the Super Bowl will be commissioned to work on a Doritos brand project with The Lonely Island, the Andy Samberg-helmed comedy group. A second spot, selected by a Doritos internal team, will also air during the Super Bowl. Posted here are the five finalists, along with the commercial which promoted the Crash The Bowl project. The Crash the Super Bowl site and other promotional content was developed at Goodby Silverstein & Partners by producer Todd Porter. Sound was produced at One Union by senior engineer Eben Carr.